Amanda Francey is an illustrator based in Brisbane. She studied at Queensland College of Art and worked for over a decade in graphic design before returning to her childhood passion of drawing. Amanda's illustrations have appeared on cards, stationery and packaging, as well as gracing the walls of children's rooms all over the world. More recently, Amanda illustrated her first picture bookJonathan!. Have you always wanted to be a children’s book illustrator? Yes, since upper primary school when I won a special award for best story during Book Week of 1986. I kept the award as a reminder of the day my school librarian took me on a Book Week excursion. It was the experience of meeting authors and illustrators that planted the seed. My school librarian also played a part in it. She seemed pretty wrapped with my picture book, so I gave it to her. I can't even remember what it was about. I never lost sight of my childhood dream. It remained in the background all the years I spent working in graphic design and becoming a mother of three. Peter Carnavas is the author of Jonathan! How did the collaboration between the two of you happen? That was the year all my kids had started school and I had planned to finally pursue my childhood dream. Attending a picture book workshop with Virginia Lowe and Peter Carnavas was my first step. During the workshop, Peter saw some of my illustrations and encouraged me to send my portfolio to New Frontier Publishing. He had so kindly emailed my website link to his publisher and put in a good word for me too. A little while later, Peter mentioned to me that he had more stories in his head than he was able to illustrate and said he would be happy for me to illustrate one of his stories in the future. And it wasn't long after that I received an email from New Frontier Publishing asking if I would like to illustrate Jonathan! I'm pretty sure I fell of my chair at that point. I have a lot to thank Peter for and it was such an honour to illustrate one of his books, as I'm a huge fan of his work. Which illustrators do you draw inspiration from? I love the work of Ann James, Anna Walker, Freya Blackwood and Emma Quay. While their styles are different, these artists all capture children and animals so beautifully. Tell us about your technique? Most of my illustrations are created using a mix of pencil, watercolour and digital. I tend to scan in all my hand drawn and painted bits to give my final illustration a more traditional feel. All of my illustrations are completed in Photoshop using a Wacom tablet and pen mouse. I also make custom paint brushes and textures in Photoshop out of pencil, paint, watercolour washes, tea stains, sponge blogs and fabric etc… I really enjoy the process of mixing traditional with digital as the creative possibilities are endless. Something new can be brought into each illustration, keeping the process fun and refreshing for me. 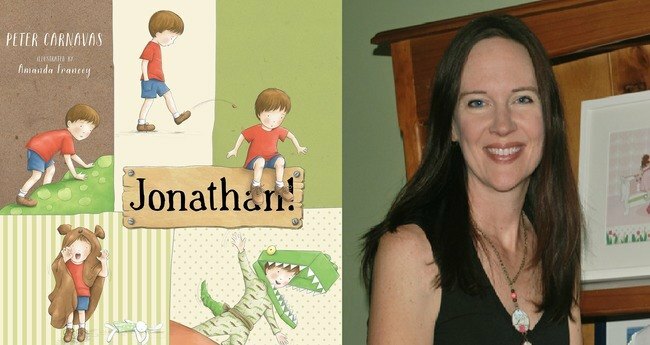 How did you celebrate the release of Jonathan!, your first picture book? Well, I've celebrated Jonathan! many times. When I received the contract, I celebrated with my dog (we were the only ones home). When I finished the book, I celebrated with my family. When I received my first hard copy, I celebrated with my family and told everyone I know and lots of people I don't know. Facebook is good for that. The week before the release I started counting down the days with joy. The day before the release, my excited daughter showed Jonathan! to her class. On the actual day of the release, we were all so busy with Saturday swimming, cricket and kids pool parties that we completely forgot about it until Sunday! So we celebrated Sunday night with a glass of wine, an overcooked lasagne and ice-cream for all those who ate their salad without complaining.